The Days of Johann, an agility dog! 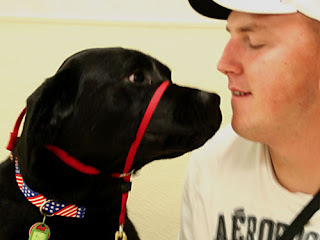 : This Veterans Day we salute our K9 war heroes and those that provide service and therapy to veterans in need! This Veterans Day we salute our K9 war heroes and those that provide service and therapy to veterans in need! Today is Veterans Day in the United States, and we are saluting all the dogs that serve our country, as well as the many service and therapy dogs that provide our returning disabled and injured veterans with the help they need to cope with the challenges of every day life. War dogs are veterans too. 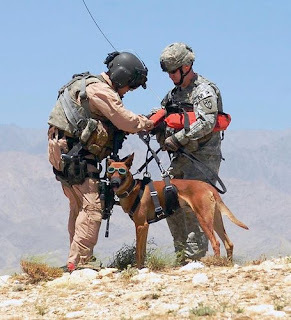 Working along side brave soldiers, K9 Corps have helped soldiers since WW I fight for our freedom - saving many, many lives, with no regard for their own. Visit my Dogs of War lens and learn more about our canine military heroes throughout history. This lens honors these canine heroes who give of their lives to veterans throughout the United States, and serve them selfishly - providing them with much needed assistance, comfort and friendship. A big HOOAH from all of us! May God bless and protect all of our veterans - two-legged and four! Salute to the veteran dogs! That's really neat about the "Walter Reed" for canines. It's about time the K-9 dogs were recognized for all they do by giving them the care they deserve. It's got to be good for the morale of their human charges as well.